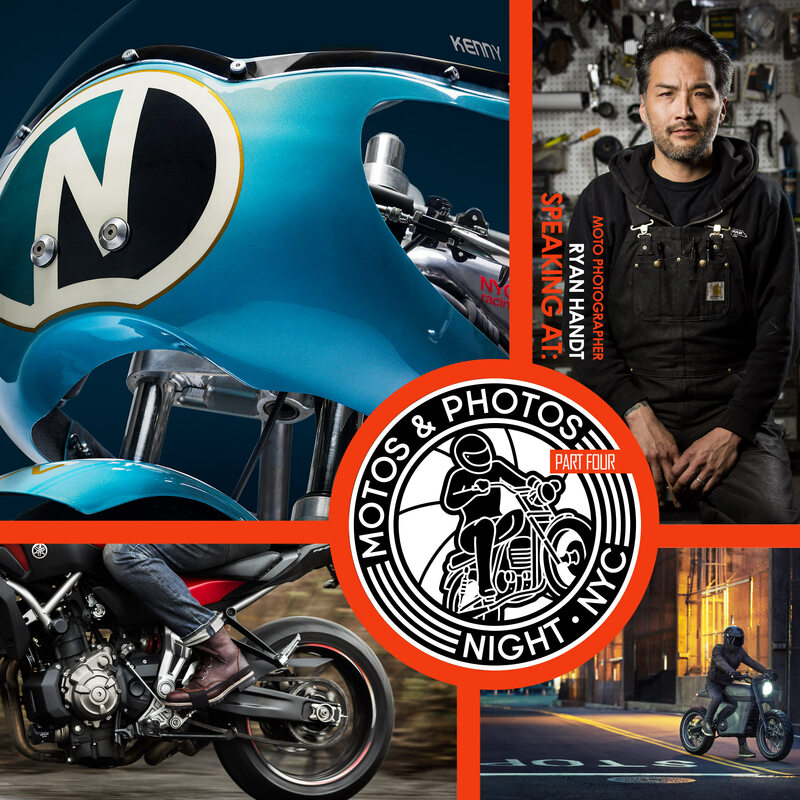 We're building a community of NYC-based motorcycle photographers, promoting interchange, common events, mentorship, education and inspiring content through a monthly, off-season photo night here in the city. 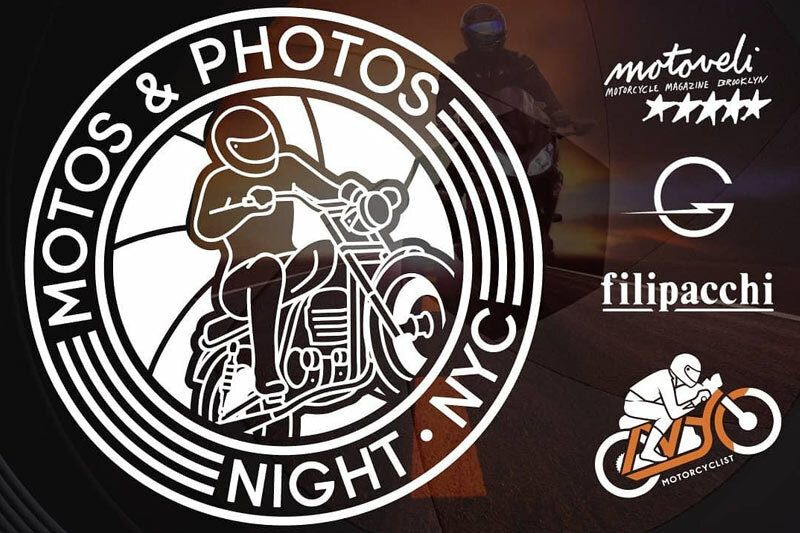 The event brings together moto enthusiasts/photographers to socialize and talk about riding and shooting ... we'll have profiled photographers speaking about their experiences, inspirations and advice, and a regular panel discussing moto-photo related topics. After December events will be held on one of the last two Thursdays of the month through April, with a special ride-in gallery finale planned for May. December's inaugural event featured talks with Grace Roselli, Dean 'Chooch' Landry and Mike Higgins. (feature & gallery) January luminaries included John Saponara, Allan Tannenbaum and Corinna Mantlo. And March spotlighted filmmakers Kate O'Connor Morris, Jean Pierre (JP) Kathöfer and Demian Neufeld. 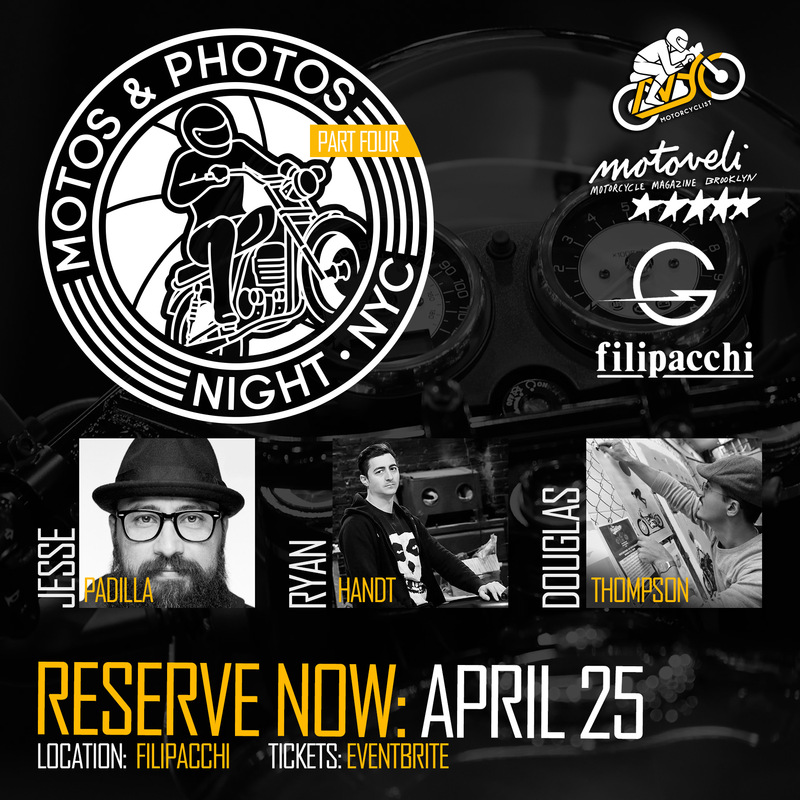 Filipacchi in Nolita, Manhattan -- will host our fourth event, Thursday, April 25. This event will be ticketed. Doors open at 6:30 PM with the event set to start at 7 PM sharp, and running to 10 PM. Jesse Padilla: Known in the photo world as Otter LaRouche, Jesse prides himself on taking the analog version of photography as far as it will go. 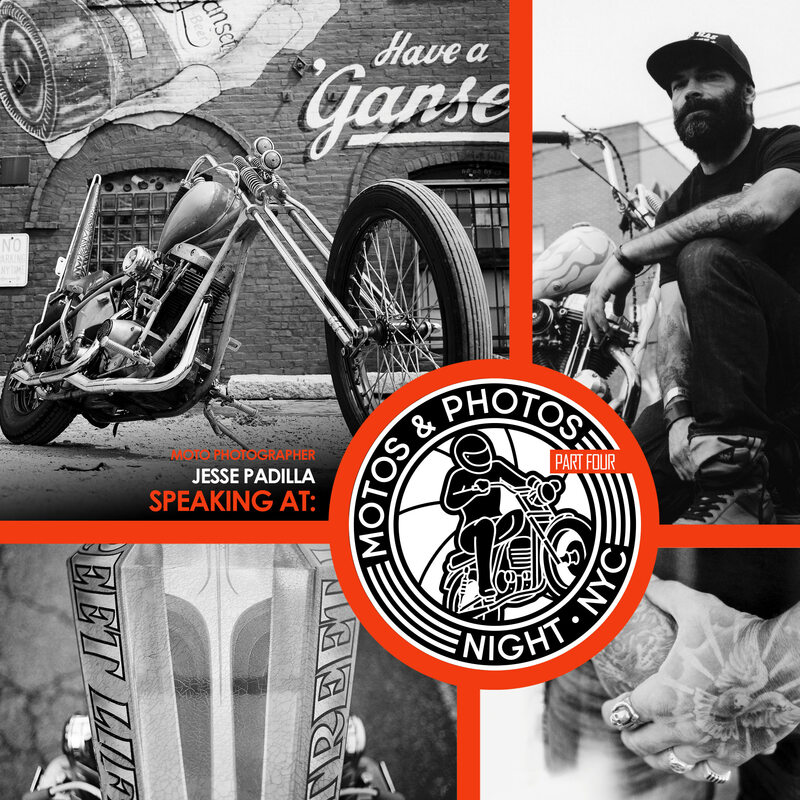 His style, particularly when he documents moto culture, tends to drift toward black and white, high contrast, sometimes grainy images. Padilla is attracted to vintage tech, whether it's the film cameras he uses or the classic cars and motorcycles he favors when shooting. For his NYC Motorcyclist gallery, the Los Angeles-born, 40-something pored over 1000s of images, scanning negatives from his back catalogue of work. It's the first time these images have been showcased publicly. He is also currently working on a coffee-table book, a historical rider’s guide to motorcycle routes from the Carolinas to Maine, highlighting landscape images he shot of the areas and the roads along the way. Ryan Handt: It's a rare combination when a photographer is equally adept at capturing both exquisitely lit studio shots, and photojournalistic images conveying action, emotion and the mood of a scene. Ryan Handt has made a name from himself in NY moto circles, and around the country, for doing just that ... producing a stunning collection of motorcycle photos for custom builders, including Brooklyn's own Keino ... and being a regular shooter at events such as the Brooklyn Invitational, the Race of Gentlemen, AHRMA races and the Appalachian Moto Jam. More recently Handt's accomplishments have included several exciting projects, from documenting local electric motorcycle entrepreneurs Tarform to lifestyle shoots with Mercedes and Aston Martin, featuring James Bond himself, Daniel Craig. Handt will be showcasing two new portrait projects he's working on: 'New York Motorcycles' and 'Faces of: Motorcycle'. 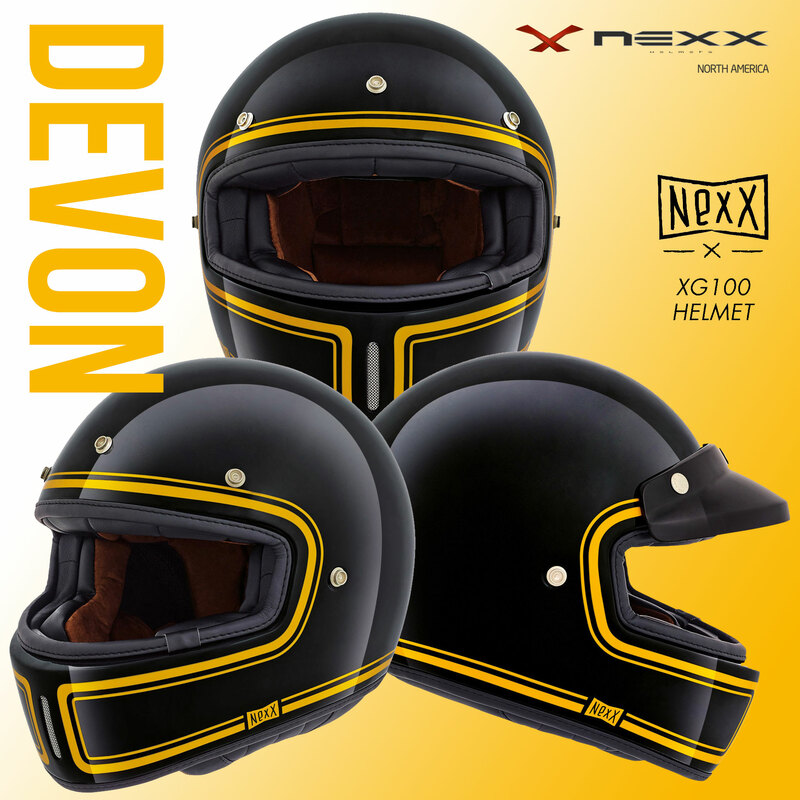 Douglas Thompson: If you haven't seen Tempus Deficit's whimsical artwork online or at the annual Oil and Ink Expo, you've missed out on a fresh look into the moto world and riding. We'll interview the 39-year-old Connecticut-based moto artist about the inspiration behind his lofty creations, which pair motorcycles with symbols of flight, freedom and fancy. In his own words: "Floating becomes a metaphor for letting go, and the whole concept is fascinating to me as a representation of freedom and lightheartedness. This is also how I think of motorcycling; riding is a freeing and lighthearted act. So, these two seemingly incongruent things actually line right up." Each will get some individual time to discuss their journey. And all three will be taking questions following their talks. 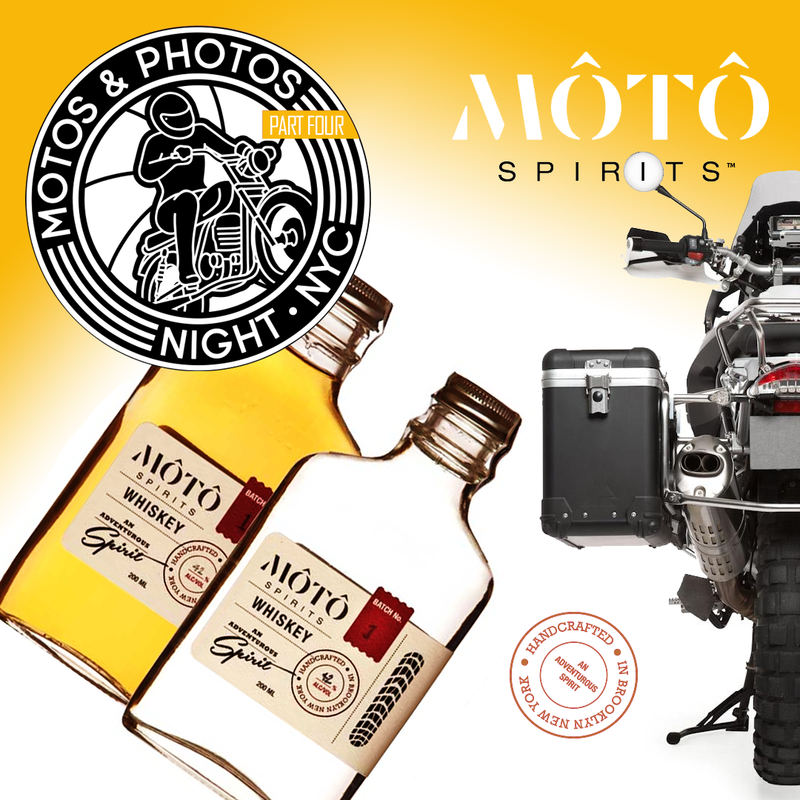 We are honored to have MOTO SPIRITS with us again with samples from their Brooklyn-made Whiskey line as well as bottles for sale ... and $5 cocktails! 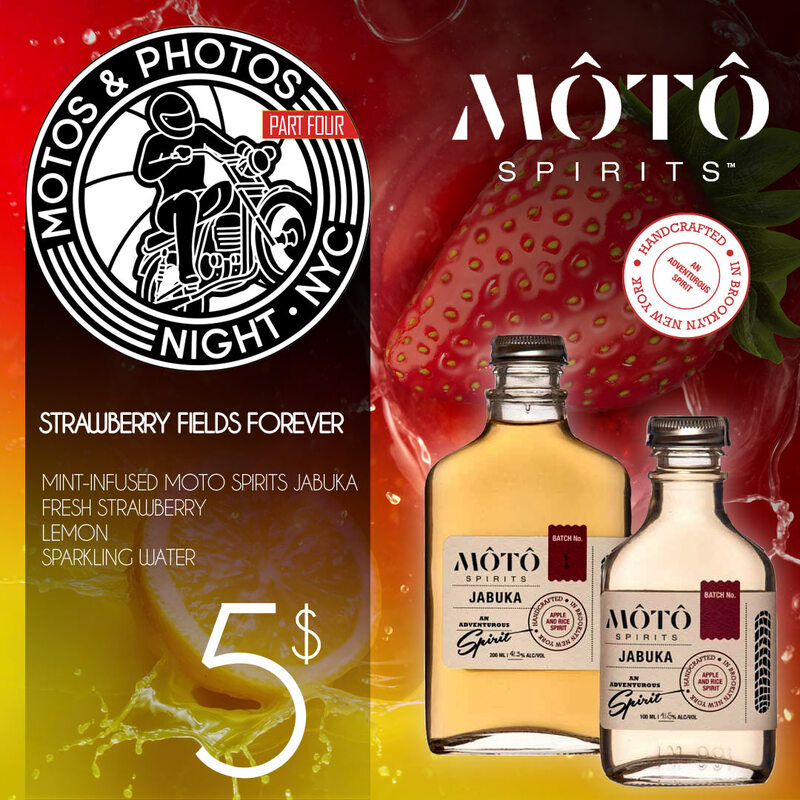 They'll be serving a Strawberry Fields Forever: mint-infused Moto Spirits Jabuka, fresh strawberry, lemon and sparkling water. 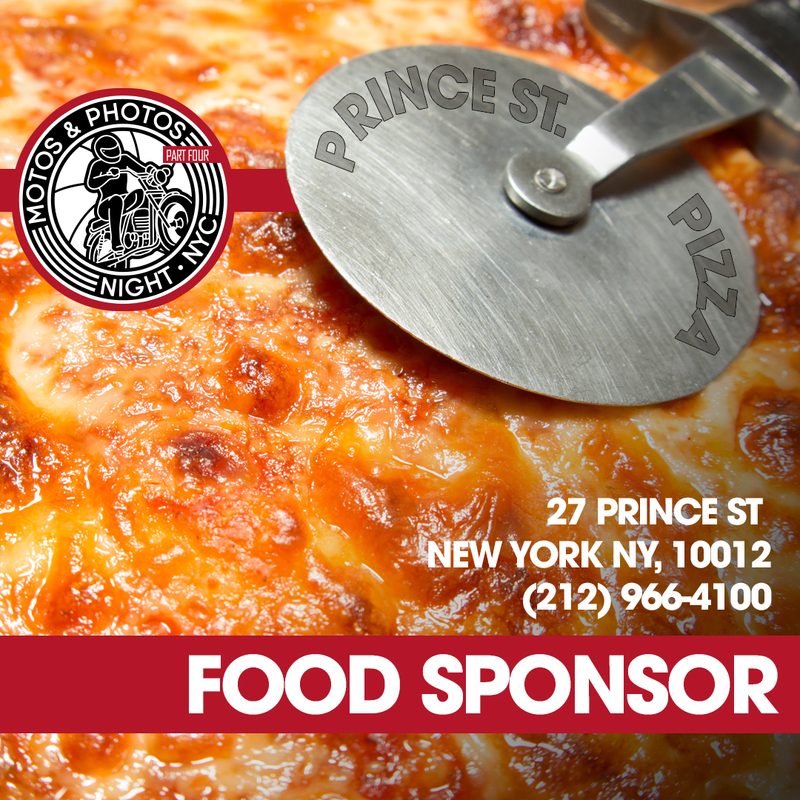 Motos and Photos : NYC attendees will also get to sample some pies from Prince St. Pizza, Nolita's king of the square pizza. Every event will encourage attendees to participate, with a monthly image submission based a on specific topic. 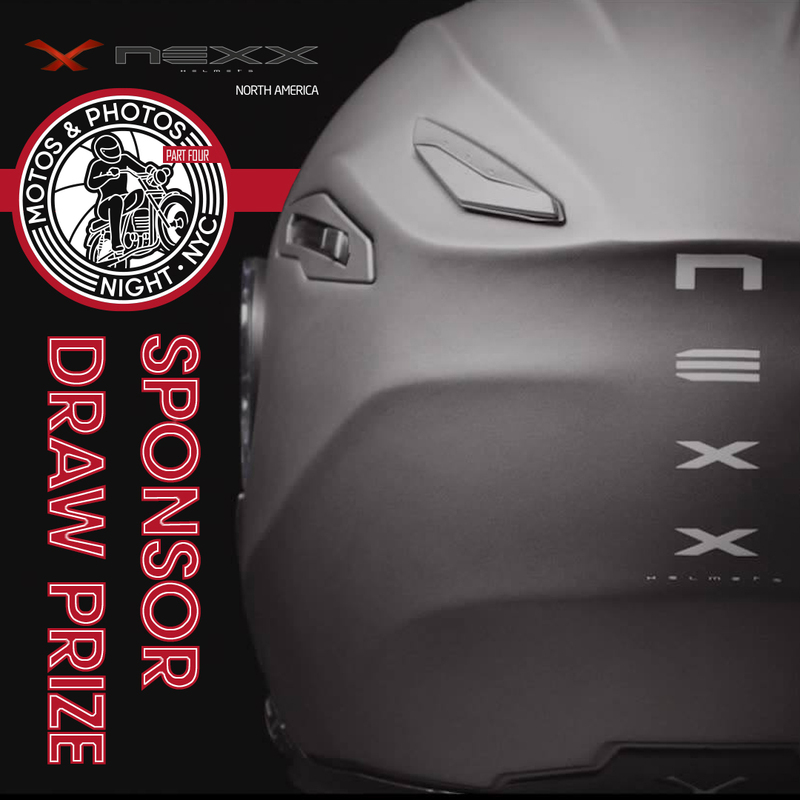 For February local photogs are asked to submit their best moto-related photo taken so far in 2019. With the chill in the air and some bikes already in storage, we all need some inspiration to hold on to. The top five, as judged by our event committee, will be shown at the event with photogs brought up to discuss their image. Images will also be put up in a gallery on NYCMotorcyclist.com and possibly be used in a future issue of Motoveli Magazine. 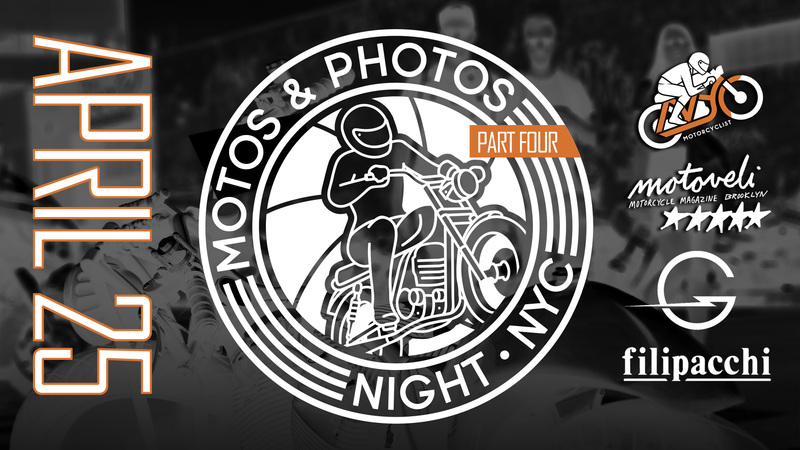 Top five entries each month will earn a limited edition Motos & Photos Night pin. 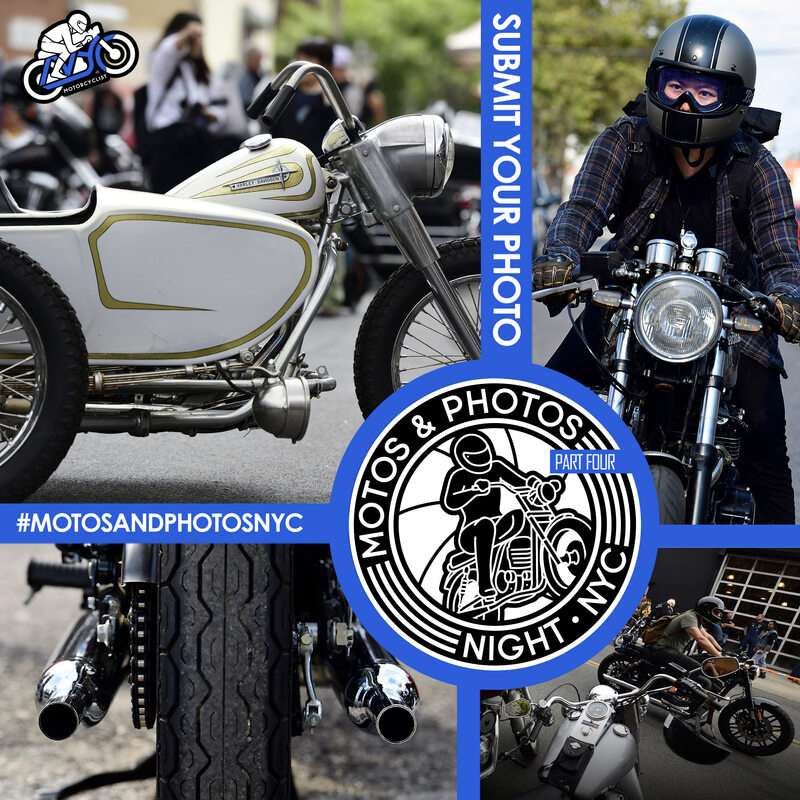 You can use the submission form to send in your photos, email them, with your details to rahoul@nycmotorcyclist.com, or hashtag them #motosandphotosnyc on Instagram. We will also have a print from one of our speakers, Douglas Thompson (@tempusdeficit), up for grabs as well. A five dollar ticket gets you in the running for both draw prizes at Motos and Photos : NYC - Part 4. You must attend the event to participate in the raffle. All funds raised go toward operational costs. 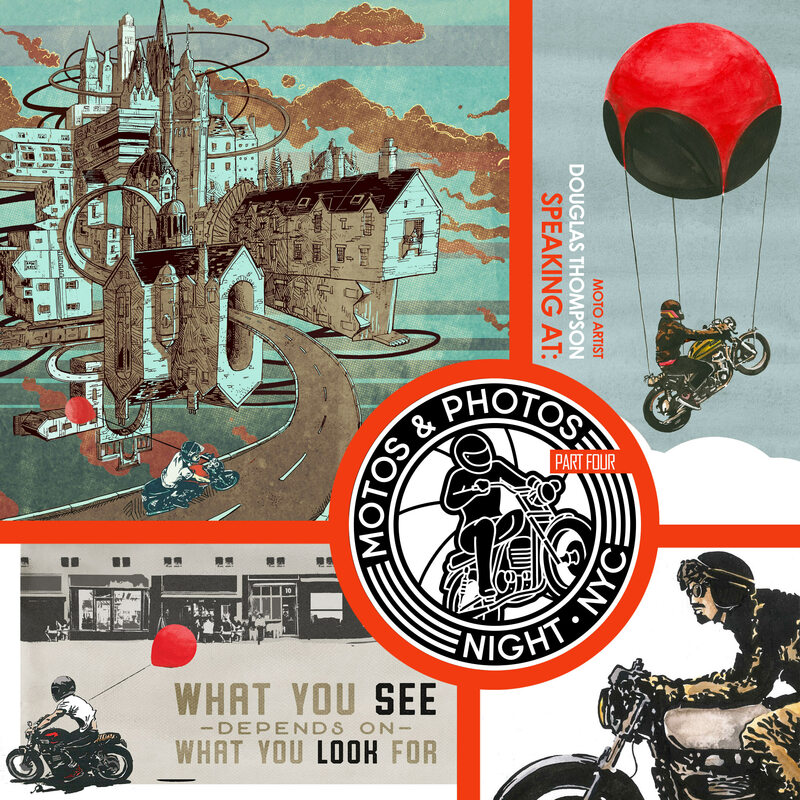 Send in your photos using the link below, or email them, with your details to rahoul@nycmotorcyclist.com. An off-season monthly meetup through April 2019 with finale ride-in gallery event set for May. We're building a community of NY-based motorcycle photographers, promoting interchange, common events, mentorship, education and inspiring content. A motorcycle enthusiast for well over two decades, Rahoul sees NYC Moto as an opportunity to combine his love of all things moto with his skills in design and photography, to ultimately enhance the NYC scene for all local riders. A designer and entrepreneur, Ryan Snelson is the creator of Motoveli Motorcycle Magazine, the Brooklyn-based print publication for riders and creators. Motoveli is published as a limited edition and released three times per year. A recent convert to the moto world, Kirsten is driven by a desire to educate, inspire, and connect. You can usually find her roaming around local garages or organizing events such as Moto Market NYC. A writer, photo buff and vintage moto junky, Mike Higgins is co-lead organizer for the NYC DGR and a co-founder of Godspeed Co.. He can often be seen two-wheeling it around town on his '67 Honda CB450 -- dubbed the Black Bomber.